Call me a geek – but turns out I’m usually watching the background of most films and TV programmes I watch and absorbing the interiors… I also hate it when you can’t find something you’ve seen. So hopefully this blog post will help those of you searching for something you’ve seen in the fab Hotel GB interiors! It’s £60.00 per roll from Louise Body’s website www.louisebody.co.uk. And look at her other ranges too and they are just fantastic and I’ve been a fan for a while! Expect to pay around £800+ for a real one, or around £300 for a replica. Love these! Have also used them in one of my projects (click here to see them!). Normally around £100 each but Heals have these on half price at the time of writing this – bargain! Heals have a ready made version for £68.00 or else you can buy the fabric by the metre and make the cushions as large or as small as you’d like. Long flex pendant lights have been a big trend of late but the central fixings aren’t that easy to come across. But Historic Lighting have come to the rescue! 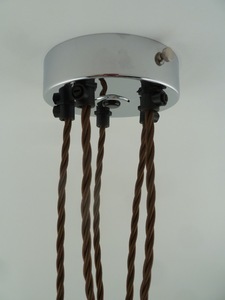 They have a range of multiple outlet ceiling roses and coloured flex that your electrician can wire up. Then add a ceiling hook to drape the flex on and a statement bulb and you’re away! In the hotel lobby they’ve made use of two pallets (exactly the one used by transportation and delivery companies all over the country) on top of each other, with a glass top. Lots of glass shops will cut you a piece of toughened glass to your size. Or else you can google pallet furniture and lots of options are coming up!